Researchers at Physik-Department and IMETUM at TUM have for the first time investigated phase contrast x-ray tomography on a living mouse. Using the new imaging methodology, they obtained, above all, extremely contrast sharp images of the respiratory organs. A research team headed by Danish physicist Dr. Martin Bech and Prof. Franz Pfeiffer from the Chair of Biomedical Physics at the TU Muenchen have created unique images from inside the body of a living mouse. 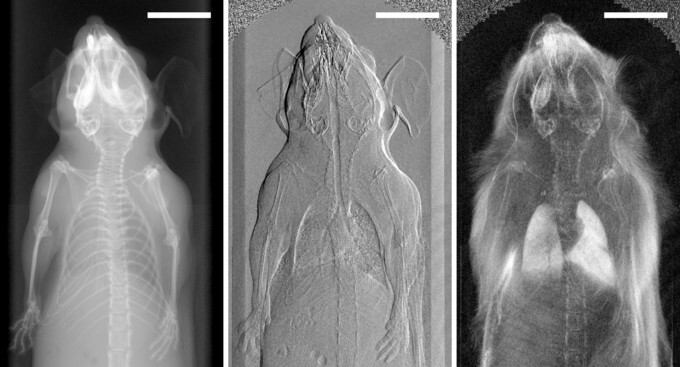 Using a specially developed small animal scanner, the researchers have, for the first time ever, taken phase-contrast x-ray images of a living mouse. This resulted in detailed images of the soft animal tissue. These first “in-vitro” images are paving the road to clinical deployment of the process. The results published in the trade journal “Scientific Reports” (November 2013, 10.1038/srep03209) show that phase-contrast x-ray tomography is particularly well suited respiratory organ imaging. The process may thus be deployed in the future for clinical diagnostics of lung disease. 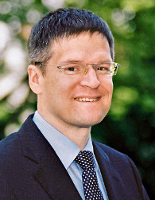 The scientists headed by Professor Franz Pfeiffer have been developing the process of phase-contrast x-ray tomography for several years. The technology has improved the imaging quality for medical diagnostics decisively. It bases on changes in the wave form of x-rays transmitted through body tissue, taking advantage of the phenomenon that x-rays are not only absorbed by tissue, but also diffracted. This provides advantages over traditional absorption based technologies like computer tomography. In comparison with conventional x-ray pictures, images obtained using the phase contrast process provide additional information on how strongly the radiation is deflected by structures in the body. The scientists headed by Martin Bech put this process to use. Using a “small animal scanner,” they have examined a living mouse for the first time. The device is a unique prototype developed at the Chair of Biomedical Physics at the Technische Universitaet Muenchen by Prof. Franz Pfeiffer in collaboration with Alexander Sasov from the firm Bruker micro CT. The researchers investigated the mouse in a specially installed apparatus, similar to a “mouse bed.” The measurements resulted in three complimentary x-ray images: a conventional x-ray image, a phase contrast image based on radiation refraction and a dark-field image based on the radiation diffusion. These first “in-vivo” images resulted in overall significantly more accurate imaging information for medical diagnostics. Particularly remarkable was that even breathing or heart beats of the mouse during the investigation had no significant negative influence on the imaging. 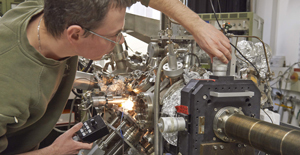 The experiment marks a further big step towards clinical application of phase-contrast x-ray tomography. The results of the research will be shared in collaboration with the Großhadern Clinic of the Ludwig-Maximillians-Universitaet. 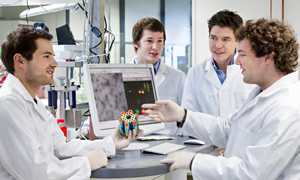 There, physicists and physicians in the Excellence Cluster Munich Center for Advanced Photonics (MAP) are investigating how x-ray based phase-contrast imaging can be used to the benefit of patients and for which kinds of medical conditions the new methodology might provide the greatest medical benefit. Initial clinical studies on tissue samples have already shown very positive results, with particularly good representations of soft tissue. A further advantage: The required radiation can be generated not only in large-scale ring accelerators, but also via conventional x-rays. Even though a number of technical challenges still need to be solved, with this experiment Martin Bech and his team of researchers have taken a significant step forward towards clinical deployment.